Vegan baking is tricky business. How can you omit butter and eggs without sacrificing flavor and texture? At Orange County based Sugar Beak Bakery, founder Ashley Fiocco has perfected vegan baking using all-natural organic (whenever possible) ingredients, fresh produce, and no refined sugars. Her products are mostly naturally gluten free, full of fiber, plant-based protein and omega-rich seeds, nuts, and grains. For the past 10 years Fiocco has worked as a personal chef in NYC, as well as alongside a celebrity chef in the SoCA area, but she always wanted to create a business of her own. When CA Assembly Bill 1616 (Cottage Food Operation) passed earlier this year, she knew she had to jump on the opportunity and start her own home-based food operation so she founded Sugar Beak Bakery. Some of her specialties include vegan and gluten-free double-chocolate spinach brownie bites, dark chocolate and coconut zucchini bread, sweet and salty vegan after school cookies, dark chocolate peanut butter cups, and vegan and gluten-free salted caramel sweet potato chocolate tartlets. All of Sugar Beak Bakery's packaging is plant-based and compostable/recyclable as well, and Fiocco plans to donate a portion of proceeds to various charities that support animal rights as well as environmental preservation and conservation. Sugar Beak Bakery items are available at SugarBeakBakery.com, or you can find them locally at Jan’s Health Bar in Costa Mesa. For more information, contact Sugar Beak Bakery at 949.491.6089 or email Ashley@sugarbeakbakery.com. Assouline is celebrating the release of its new book dedicated to Henry Segerstrom, the man behind South Coast Plaza and whose commitment and dedication brought world-class arts and culture to Orange County. 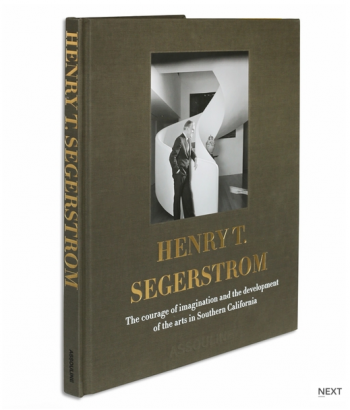 You can pick up a copy of the beautifully illustrated book, “Henry T. Segerstrom: The Courage of Imagination and the Development of the Arts in Southern California” at Assouline on Level 1, in the Nordstrom Wing at South Coast Plaza. 714.557.1882.